Stamford Talk: Eat, Think, Drive, Blog! : Camp Bow-Wow in Stamford for Pet Lodging? Camp Bow-Wow in Stamford for Pet Lodging? "Hello," says my husband in an extremely formal voice leaving a message for our vet, "we're looking to put our dog into Camp Bow-Wow..." I giggle from my spot on the couch, where I am lying because my entire body hurts today. "...so we need a copy of her vaccinations..." I start to giggle louder, because hearing my husband say the words "Camp Bow-Wow" is suddenly the funniest thing I've ever heard. By the end of his message, I'm crying, because hearing him throw around terms like "All Day Play Day Care" is just so wrong. Our dog is totally no-nonsense. She does not play, or fetch, or chase, unless it's a small rodent. Her favorite activity is lying on the couch. The last thing she wants to do is play and participate in camp-like activities, but our Bull's Head Pet Hospital lodging is full, so we've got to lodge her elsewhere. This afternoon we have to take her to meet the Camp Bow-Wow people at the Hope St. location, because she has to pass a doggie interview to be there. was too silly-sounding for me to handle. And he was reading it as if it weren't funny; I think that's why it was funny. Has anyone sent their pet to Camp Bow-Wow? What can you tell me about the Hope St. location? Or, do you recommend any other pet lodging in Stamford? We've done Best Friends in Norwalk and thought it was fine, but we'd like to stay in Stamford if possible. Update, 5 hours later: The dog totally passed her interview/trial play session, but she spent the entire 2 hours of her trial there standing atop a platform in an attempt to avoid the other dogs. Because pretty much, she doesn't think she's a dog. The staff at Camp Bow-Wow was really nice, and the other dogs seemed quite well-behaved. I did try to explain that our dog would probably be happiest if left for long periods in her cabin, chilling on her comfy cot, but you know, I think this is gonna work out fine. Since we no longer have a dog, I am not much help other than to say that we found Best Friends to be extremely expensive when we used to do it in Mass considering what you got and found that private places offered more for the money. Good luck! I am completely biased - pet smart down near where City Limits Diner is has the best Pet person in the world there - David (see my Blog). They have a pet hotal and a day camp with several levels of care. Of course the main issue, David, who is some what disabled has the best heart for these animals and the people at Pet Smart treat David very good as well. Was wondering why you're enrolling your dog in Club Bow Wow? Is it in anticipation of your pending addition to the family? Or for fun? We don't have one here, which explains my ignorance. Well, doesn't TOTALLY explain my ignorance, as I am ignorant of so many things on so many levels. But I digress ... sorry. I tend to do that. Oh no, she's not there to PLAY, or to get out of our hair. She's the most mellow, unplayful dog in existence. She will be there for a couple of overnights while we are busy with the holiday. The whole "have fun at camp" thing is something the dog has to suffer through since our vet's kennel is completely full. I might not have made that clear in the original post. We brought her in today because they like to meet the dogs before they take them. They have to make sure the dog gets along with other dogs, basically! While Bull's Head is our vet, and primary boarding location, we've also used Best Friends up in Norwalk. They do a nice job up there. Best Friends really isn't any more expensive than Bull's Head or Camp Bow Wow, I don't think. Will be interested to hear your thoughts on Camp Bow Wow and appreciate Whitemist's comments on the Pet Hotel down at Pet Smart. It's always good to have options when the mongrel needs a home away from home. We stopped boarding our dog at Bulls Head years ago after she came home with an infection. We still use them as our vet, but we're not comfortable with having our healthy animal stay in a facility that also houses sick animals--I'm sure they do their best to keep things separated, but no one's perfect. We now happily use Northwind Kennels in Bedford--a bit of a trek northward, but it's a nicer ride than traveling to Norwalk. Bull's head is on my list of place never to go again after a misdiagnosis of heart worms that caused some severre complications. I wish I had a dog that did nothing! 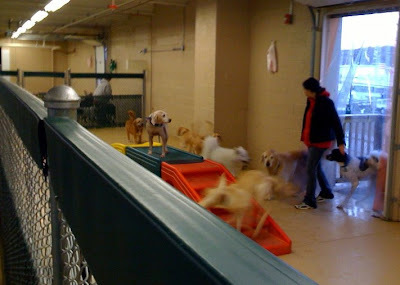 For those of us who have dogs that are high energy and drive us crazy if they don't get exercise and play time daily with other dogs, day care has been a wonderful option. And the best part is that they get used to the place through day care and then if you have to board them there, they are ok and used to the place. Yes, it's crazy, but most of us who have dogs are probably not the most normal either. I use best friends in Norwalk and they are cheaper and offer more packaged deals than Camp Bow Wow. I tried Camp Bow Wow but my dog wouldn't settle in there. They have cameras on all the time, but the counselors move in and out of the day care rooms too much that my dog wouldn't settle in as she likes people around all the time. And it was concerning that they would leave the dog day care room even for a few minutes and just rely on the camera. But if you don't have a high-strung dog, than either place is fine. They both will exhaust your dog and that is why I go. Hi - Our lab FInn has been to Camp Bow Wow several times. He LOVES it there. WE are actually leaving him there for the week between Christmas and New Years while we are away. When we were away this summer for 2 weeks he was there and we loved watching him from our computer in NAntucket. The staff is awesome at Camp Bow Wow. Every time we go there my dog practically drags me in because he is so excited to be back. My dog Benny has boarded at Camp Bow Wow and he's been really happy. Came home absolutely exhausted from all the playing! Plus they have the camper cams so you can watch them playing while you're away, although if you have a Mac the resolution isn't so great so while Benny was there I wasn't exactly sure which of the three small white fluffy dogs scampering around was him. Biggest Loser Finale on Tonight! Stamford Paint Gun Officer: Vote for Me! Sabatiello's is Closed: What Should Replace It? Christmas Day Dinner in Stamford?